Immediately after installing BarTender with WebPrint feature, when starting the BarTender Web Print Service, you get the error page not found. This problem was due to the fact that application WPS_AppPool in the IIS configuration did not start. The error in the System Log indicating that the username or password that is specified for the identity may be incorrect. There are no obvious settings for the user name and password. The installation program, in fact, did not create a local user on the server. Therefore, the login is incorrect. Per tech support, switching the IIS_WPS user to LocalSystem is an acceptable solution. 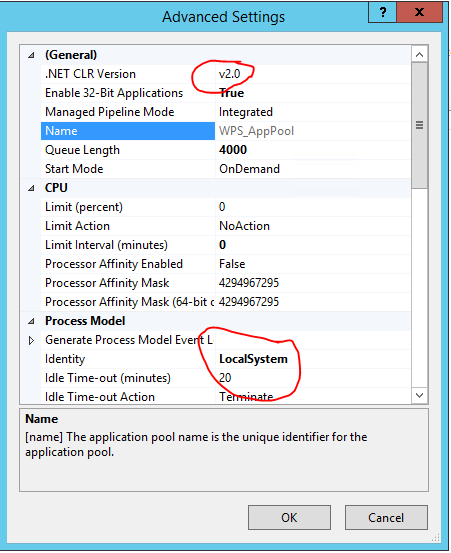 o On the Application Pools pane, right click WPS_AppPool, select Advance Settings….